They are so misleading, I agree. Leaving with a puppy that's registered, has a health "guarantee," and comes with paperwork with it's parents names certainly looks legit. The health guarantee part is really heartbreaking - some stores offer an exchange program, but how on earth could anyone trade a pup they've spent living with for another regardless of how sick theirs is. Petstores like that make me sick. I remember the interviews, vet checks, reference checks, contracts, and such I went through with all my dogs. A lengthy processes, but having well bred and healthy dogs is completely worth it. I agree! I will probably always adopt, but I respect good breeders. It's really sad the lies they tell. I was once being recruited to work for a pet store. They were going to make me "kennel manager" with twice the pay I was already making as a groomer and I was going to be caring for the puppies. Right then and there, I was like where do you get these dogs? "Oh, they come from reputable breeders." Yeah, right... I did not take the job. 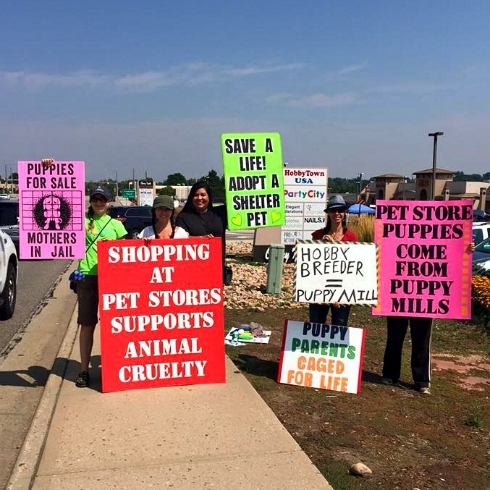 I don't understand how puppy mills can still happen. It's so depressing. It really is, Lauren. I hope we are on the precipice of big changes. I was once walking around a pet store with my dog on a leash. A person who spoke very little English wanted to buy my dog. She thought that my dog was a pet store dog and was for sale. I couldn't get the message across that "NO - my dog is not for sale" so I just fled the store as fast as I could. That showed me how clueless some pet buyers are. Just based on how my dog looked, this random person wanted to buy her. No research, no questions. Crazy. Thanks for trying to educate people. Pet stores encourage those kinds of impulse buys and discourage real research - how very strange that someone thought they could buy your dog from you! I am ashamed to admit that I bought my dog Nelly at a pet store 8 years ago. I asked specifically where she came from and was told a local breeder-that she was the last of the litter. I was devastated when I got her papers and saw she was from Arizona. She had kennel cough and later had to have part of her femur removed due to a congenital condition. It makes me sick to think that even though I knew better to a degree, I supported a puppy mill and a store that sold puppy mill puppies. All we can do is keep learning and growing once we have the knowledge, Beth. My grandparents bought a Shih-Tzu puppy from a pet store - they were real pioneers that long ago and knew better even then, but they felt terrible for her that she was so sick. They rescued many dogs over the years and I believe my love for dogs is genetic. We have a big problem here with lots of stores selling dogs. They all make those same claims. I wish people would stop falling for it. This is such important information. You've done some really thorough research. I haven't (thankfully) seen a pet store selling puppies here in AZ in forever, but I know the stores are still out there. Such a shame. Keep up the good work! It's great you haven't seen any, and Phoenix just passed legislation that pet stores can only sell puppies and kittens from shelters! Great information - da bestest fing anyone can do when dey want a fuzzy family member: go to a shelter or rescue! Your post is so very important - I'm sharing; and 'lub' da fact dat you wrote about dis super duper important topic! Important information to know. I believe my mom's dog came from a puppy mill because of the health issues he has. He is well loved and taken care of. My girls did come from a breeder. I went to her house and all of the cats were inside the house and treated like members of the family. The house was designed to keep the males away from the females and there was also a special place for the queens and their kittens. I did my research and found a very reputable breeder and have two wonderful Persian cats. I'm glad your kitties got a great home with you! It's really given me a new perspective on the AKC. I usually go to the big dog show here in Denver every spring but I'm debating if I want to support them in any way now. IT's not just puppies either. Look at bird mills. Anywhere there is money to be made, there are mills making it.